Good morning and happy Friday! Who’s ready for the weekend? I am! Our town is having a War Between the States battle tomorrow and Sunday and it’s always a ton of fun. But that means it’s been busy around here. 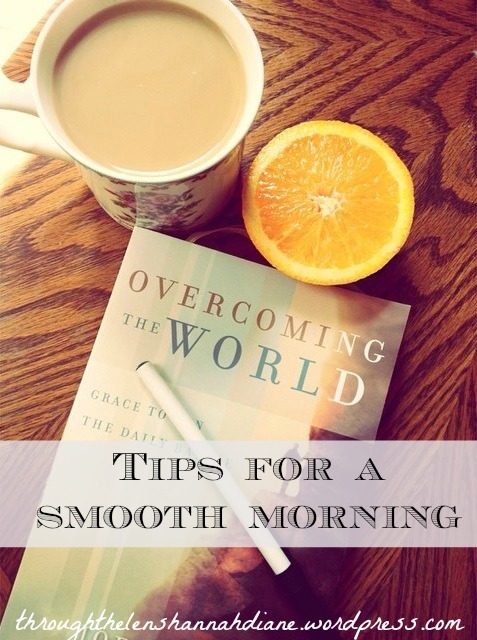 On to today’s post….how to have a smooth morning. Let me just say right now…I am not a morning person. Scratch that…I wasn’t a morning person. I am one now (I would like to think). Granted, I’m not a parent. I don’t have twelve (or two) little ones running around yet or ‘messing up my morning’. But when I lived at home, let me tell ya. There were some crazy mornings. Enough to make you not want to get out of bed. These are some tips I implemented before I was married, and have now added on to since then. By no means am I an expert in this area….but I’d like to think I’m growing. And these are the things that make my morning go smoother…. Don’t do it! Just don’t. You’ll feel rushed and like you can’t keep up with what needs to be done. For me, I feel a bit out of control if I hit snooze. Just get up when you said you would. It’s good practice in controlling one’s body. Right away. Don’t wait until half your day is whittled away. I like to make mine while I’ll making breakfast or while Hubby is getting ready for work and I’m waiting for our Bible reading. I put everything down on my list. Including my shower. If you’re going to do it, write it down, then cross it out! That way you know what you’ve accomplished and keep you on track for what’s next. I know you can’t have your devotions every single morning. Some things happen. But to get time in with your Lord will help your attitude immensely. And if you don’t have time for that…you DO have time to pray. Even if it’s in the shower. Preferably sitting down at the table to have a breather. Sometimes breakfast and supper are the only times you have to sit and relax. Enjoy them. And enjoy the people you are with! What about you? How do YOU have a smooth morning? 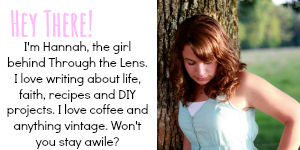 I’d love to hear your thoughts!